Rocky subtidal habitat includes all hard substrate areas of the ocean bottom. The geologic origin substrate components include cobble and boulder in the CMECS unconsolidated mineral substrate class and bedrock and megaclasts in the rock substrate class. Anthropogenic origin hard substrates are also here. Anthropogenic reefs include any areas where hard, persistent material has been placed either purposely or accidentally by humans. Examples include rock jetties at the entrance to many bays, shipwrecks, anchoring systems for renewable energy projects, and unburied portions of underwater cables or pipelines. Rocky subtidal areas are often referred to as reefs, rocky reefs, rocky banks, pinnacles, or “hard bottom.” Rocky subtidal habitats, including both the natural and anthropogenic components, are characterized by CMECS as being within the subtidal zones of the nearshore and offshore marine subsystems. Although most areas are never exposed to air, the CMECS subtidal definition does include areas that are exposed intermittently each month when tide levels fall below the Mean Lower Low Water (MLLW) level. Rocky subtidal habitats are found in both the nearshore subsystem and offshore subsystem and some of the differences are discussed below. Some rocky subtidal areas are extensions of shoreline rocky features such as headlands, cliffs, or rocky intertidal habitat, while others exist as isolated regions of rock surrounded by habitat with soft bottom substrate. Rocky reefs have varied topography; some may barely come above the surrounding seafloor, while others may rise from the seafloor many meters, or extend above the surface to form islands in the Territorial Sea. There are more than 1,800 islands off the coast of Oregon, the bases of which form rocky subtidal habitat. The physical characteristics of rocky subtidal habitats reflect proximity to shore, depth of the water, local seafloor geology, erosional forces, and biological influences. The geology of many rocky subtidal areas mimics the geology of adjacent landforms, often consisting of erosion-resistant basalts or metamorphic rock common in Oregon’s rocky headlands. Over geologic time, the underwater rock features have been uplifted, bent, deformed, and alternately exposed to ocean and terrestrial erosional forces as successive ice ages and geologic forces caused massive sea level changes. These forces have shaped a variety of physical habitat features within reefs, including flat rocky benches, stacks, jagged ridges, broken boulder fields, and a vast number of cracks and crevices that provide shelter and substrate to abundant life. Oceanographic processes and features strongly influence the rocky subtidal environment. Subtidal reefs are exposed to pounding wave action, underwater currents, and the physical and chemical properties of the water. These factors in turn influence the biological communities on the reefs. Generally, nearshore reefs are more exposed to wave action than offshore reefs, and the wave action is much stronger in winter than during summer. Wave action is a key factor in determining the types of organisms that can live on the very shallow reefs. Ocean currents vary widely by location, time of year, and over tidal cycles. Currents influence reefs in a variety of ways including direct erosion, sand scour or burial of reef areas, and movement of organisms to and from reefs, including plankton and larva. Large-scale or long-term variation in the ocean environment such as upwelling, seasonal current directional shifts, shifts in ocean circulation, water temperature variation, local and global weather patterns, ocean acidification, and biological processes combine to determine the ambient chemical and physical composition of the water in rocky subtidal habitats. The CMECS water column components can be used to describe important features of the waters surrounding and overlying rocky reefs that are important in shaping the biological communities which live there. The 30 m depth contour is defined by CMECS as the boundary for the nearshore subsystem and the offshore subsystem. Nearshore rocky reefs differ from offshore reefs in some key physical characteristics. Light penetration is adequate to support algal life on nearshore reefs, while offshore reefs support far less algal growth. For example kelp is only found in nearshore subsystem rocky areas. Wave action, currents, and storms produce a higher energy environment on nearshore reefs than their deeper counterparts. Organisms adapted to higher energy environments are more prevalent in the nearshore area. On some reefs, strong currents can scour and seasonally bury or expose the rocks with sand, considerably influencing the types of organisms that can utilize those rocky subtidal environments. The difference in detail in the new habitat maps, compared with those available for the 2006 version of the Nearshore Strategy is striking. Use of the CMECS substrate component system also provides far more detail. A good example is the area off Cape Arago (Figure 6.7) where at a larger scale the differences are very apparent. Figure 6.7. 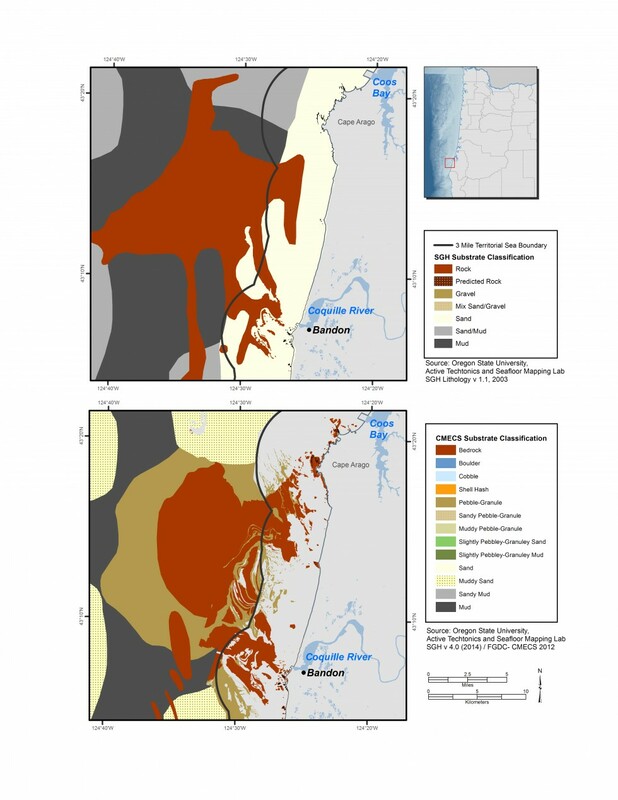 Detail map of the area off Cape Arago, Oregon included in original version of the Oregon Nearshore Strategy (a) and map of the same area that incorporates data from surveys with modern sonar technologies and the CMECS classification of substrate components (b). Subtidal rocky reefs are known for their abundant and diverse biological communities. The variety in topography, substrate characteristics, and depths within and among rocky reefs produces a plethora of microhabitats, often within relatively small geographic areas. This in turn provides for a diversity of species adapted to life in these different microhabitats. Habitat-forming organisms, such as kelp or attached invertebrates, provide additional microhabitats used by reef species. Most nearshore rocky reefs have rich algal, invertebrate, fish, bird, and marine mammal communities. Depending on water depth, light penetration, wave energy, and other physical and biological processes, algae and macroalgae can provide extensive or sporadic cover and food for other species in the nearshore subsystem. Algae and macroalgae include encrusting forms that grow close to the rock surface, turf forms that can create a dense layer up to a foot thick or more, subcanopy forms that provide added subsurface habitat structure, and canopy forms that create kelp “forests” which may break the surface of the water. Offshore rocky reefs in deeper water do not have kelp forests. Free-swimming (nektonic), drifting (planktonic), and attached invertebrates are common in both the nearshore and offshore rocky subtidal habitats. Many Strategy, Watch List, and other commonly associate species inhabit rocky subtidal habitats (Table 6.3, Appendix E and F). Fishes such as black, blue, china, deacon, copper and quillback rockfish, wolf eel, pile and stripped perch, lingcod, cabezon and greenlings, along with a large variety of smaller sculpins, gunnels, poachers, blennies and others are associated with rocky subtidal habitat. Diving seabirds and marine mammals forage extensively in rocky subtidal areas. A wide variety of filter or suspension feeding invertebrates attach to hard substrates such as sponges, anemones, barnacles, bryozoans, hydrozoans, tunicates, and coldwater corals. Mobile invertebrates abound here as well. Red and purple urchins, red and flat abalone eat algae attached to the rocks. Ochre, sunflower and other sea stars forage in subtidal rocky habitats as do crabs, shrimps, brittle stars, nudibranchs, chitons, and worms. The diversity of producers and consumers found in the rocky subtidal creates complex food webs and interdependencies among organisms. Reefs are linked to surrounding environments by ocean currents and organism movements. Reef topographic structure often slows currents, enhancing the local community’s ability to capture drifting organisms, an effect enhanced by the occasional presence of large kelp beds. Many organisms move on and off reefs, some in large-scale migrations and others in short feeding forays to other areas. While most nearshore reef fishes occupy both nearshore and offshore reefs, there are differences in depth preferences of some species and life history stages. Several fish species depend on nearshore rocky reefs during early life history stages before moving off to deeper reefs, the continental shelf, or other areas as they grow. Conversely, some fish depend on estuaries or rocky intertidal habitat for early life history stages before moving to rocky subtidal areas as adults. For example kelp greenling, cabezon, and grass rockfish tend to be more prevalent on the nearshore reefs. Canary and yelloweye rockfish move from nearshore to offshore reefs as they grow. Many fish species are entirely dependent on reefs for parts of their life cycle, while others are visitors. Common visitors include herring, smelt, sharks, ratfish, and salmon. Ecological linkages within and between rocky subtidal habitats help to shape their biological communities and the diversity of species found in this habitat type. Currents bring in planktonic organisms and transport drifting larvae to and from disparate rocky subtidal habitats. The location of reefs with respect to other “upstream” or “downstream” reefs has a dramatic effect on the types, abundance, and recruitment rates of the reef’s communities and organisms. This complexity of organism interrelationships makes the outcome of natural or human disturbance to reefs difficult to measure or predict. Photo Credit: Bastet Photography. Bull kelp forms extensive kelp beds in places along the Oregon coast. The extent of these kelp beds changes with oceanographic conditions each year as this alga lives up to about 18 months at most. Kelp beds are a significant subset of Oregon’s rocky subtidal habitat. 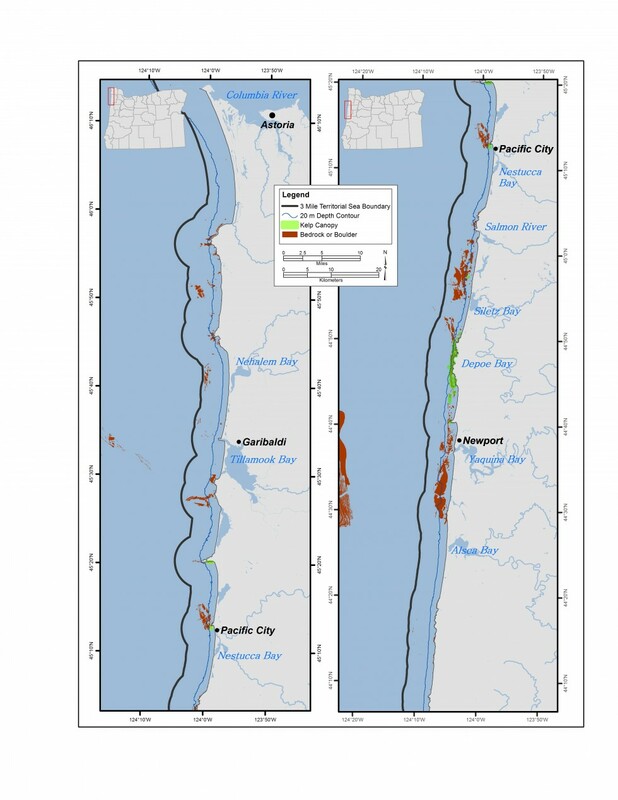 CMECS classifies kelp beds as a biotic component of Oregon’s rocky subtidal habitat, and more specifically as canopy-forming algal beds. Kelp beds, found on many of Oregon’s nearshore rocky reefs, consist of an aggregation of one or more species of brown macroalgae that generally grow from the seafloor to the ocean surface and form a floating canopy of kelp. While kelp beds can be found all along the Oregon coast, the strip of coast from Cape Arago south contains approximately 92 percent of the state’s kelp beds (Figures 6.8a and 6.8b). Most kelp beds in Oregon consist of bull kelp (Nereocystis luetkeana). While kelp beds appear common due to their visibility from shore, they are actually relatively scarce habitats in Oregon’s waters, covering less than one percent of the nearshore area. The presence and attributes of kelp beds depend on a number of physical and biological variables. The primary variables determining where kelp might exist include water depth and substrate availability. In Oregon’s waters, kelp beds only form on rocky substrate and are limited to the nearshore subsystem. Beyond that depth, low light levels on the seafloor limit the growth of kelp. However, light and substrate are not the only limiting factors; many rocky reefs in the appropriate depth range rarely or never support kelp beds. Factors that may limit kelp on these reefs include seasonal sand burial of the reef, sand scour of the rocks, overexposure to wave and storm energy, locally high turbidity, lack of nutrients, distance of the reef to “seeding” sources of kelp, abundance of organisms that consume kelp (e.g., sea urchins), and competition with invertebrates and other algae for rock substrate available for attachment. Kelp beds in Oregon display pronounced seasonal and annual variation in extent and density. Bull kelp beds grow rapidly in spring and summer, followed by a winter period when storms dislodge much of the algae, leaving little or no surface canopy. The biomass of kelp beds can also vary ten-fold or more from year to year due to interannual variation in the combinations of physical and biological variables that affect their growth. Kelp beds are biologically rich habitats due to both the primary productivity of the kelp and the effect kelp beds have on the surrounding environment. Bull kelp is one of the fastest growing organisms in the world, annually providing a large biomass available for consumption directly or as detritus after the kelp dies. Kelp furnishes a vertical habitat structure that otherwise would not exist on the reef. Kelp beds also slow water currents and reduce waves and wind chop, helping to trap drifting larva and nutrients and providing shelter. Kelp beds and their canopies can also support a rich understory of algal and attached invertebrate cover. On Oregon reefs, dense understory algae coverage gives way to dominant invertebrate cover at about 5 to 10 m water depth. Thick kelp cover reduces light penetration and can limit the density of understory algae. The kelp bed and underlying reef support a diverse array of fish and invertebrate species and provide cover and foraging areas for diving seabirds and marine mammals. In Oregon, the mix of fish species on kelp bed and non-kelp bed reefs is similar. In most parts of the world where kelp beds have been studied, reefs with kelp beds have much higher densities of fish than similar reefs without kelp. In Oregon, this does not appear to be the case. However, there have been no quantitative comparative studies to confirm this. Figure 6.8a. Kelp beds along the north Oregon coast. Map shows maximum extent of kelp beds based on surveys. Figure 6.8b. Kelp beds along the south Oregon coast. Map shows maximum extent of kelp based on surveys. Human uses of nearshore rocky reefs include fishing, scientific research, sightseeing, and a number of other recreational and industrial pursuits. Commercial and recreational fishing for many types of rockfish species, lingcod, cabezon, and kelp greenling are the primary human uses of this habitat to date. SCUBA diving and underwater photography are among the other less prevalent uses. Much of the commercial live fish fishery takes place on shallow nearshore reefs. Recreational anglers also favor shallow nearshore reef, if they are available. Commercial fishing effort targeting nearshore species tends to be higher on the south coast and recreational effort more prevalent on the north coast. A unique potential commercial use is the harvest of kelp. Commercial kelp harvest has been tried several times in Oregon on a small scale in the past. 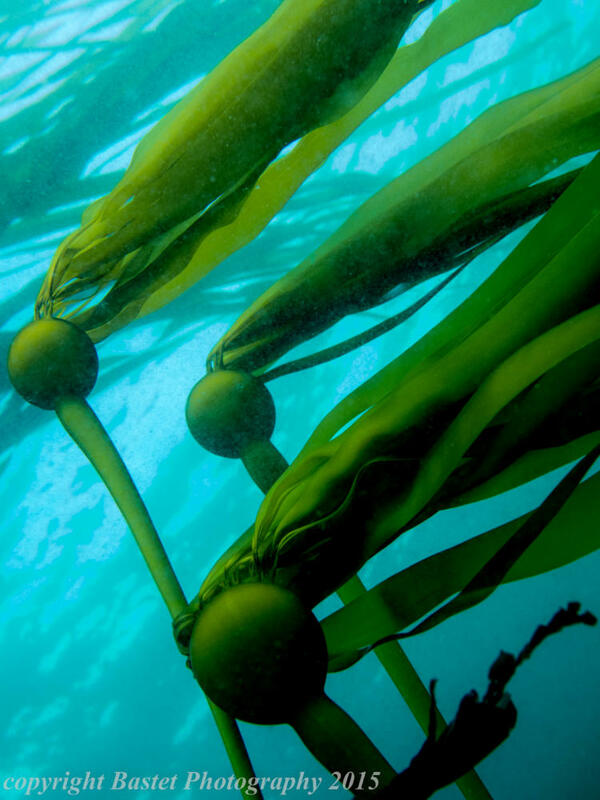 Currently there is no commercial harvest of kelp. Many reefs are used recreationally by SCUBA divers, sea kayakers, boaters, and surfers. Reefs with extensive kelp beds and islands provide sightseeing and bird watching opportunities for coastal residents and visitors. However, many reefs have no features extending to the ocean surface, and thus many people are unaware of the teeming life existing just below the water’s surface. Many nearshore species that inhabit subtidal rocky reefs are important both ecologically and economically. Black, blue, China, deacon, copper and quillback rockfishes, cabezon, kelp greenling, lingcod, sea urchins and abalone are examples. Investigating and sampling the fish and wildlife species that inhabit rocky reefs is thus of great interest to scientists and fishery managers. But sampling rocky reef habitats has proven to be challenging. Bottom trawls, a sampling method widely used in soft bottom marine habitats to help assess populations of fish, cannot be used effectively in rocky habitat as the nets tend to get hung up and entangled on the rough rocky bottom. Modified trawl gear can be used in some rocky locations, but its use can dramatically alter the rocky habitat by displacing rocks along with things such as anemones and corals that live on those rocks. A variety of visual sampling methods have been used in rocky reef habitats over the years including SCUBA and remotely operated vehicles surveys. More recently video landers developed for use in Oregon waters by ODFW staff have been utilized to sample rocky reef habitat. Each method has pluses and minuses. Some highlights of video collected from a video lander, shown below, provide a glimpse into life in rocky reef habitat. ODFW is using all of these visual survey techniques to sample the community of species that inhabit rocky reefs to investigate how best to use these sampling techniques to assess populations, examine the community structure, and refine our knowledge of habitat utilization by these species.